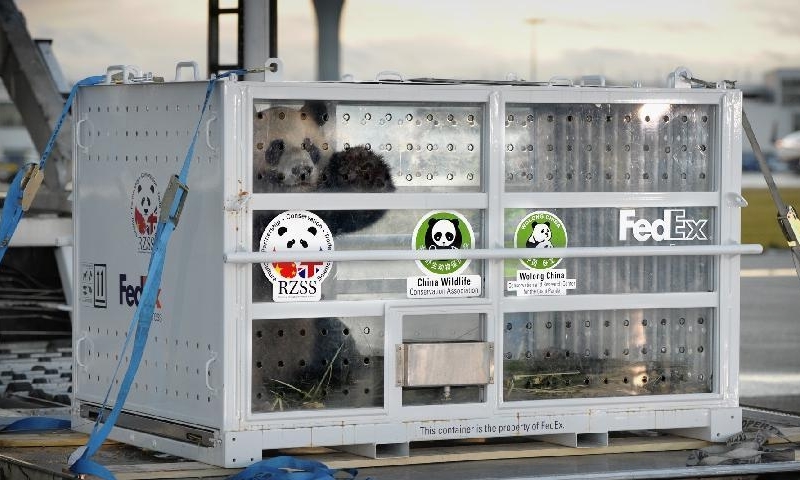 On December 4, giant pandas Tian Tian and Yang Guang safely arrived at Edinburgh Zoo. Secretary of State for Scotland Michael Moore, Deputy First Minister Nocola Sturgeon of Scotland, Lord Provost of Edinburgh George Grubb and Chairman Manus Fullerton and Chief Executive Hugh Roberts of the Royal Zoological Society of Scotland greeted the giant pandas at the airport. Chargé d'Affaires Qin Gang of the Chinese Embassy in London, Deputy Director-General Jia Jiansheng of the Department of Wildlife Conservation and Nature Reserve Management of State Forestry Administration of China and Consul-General Li Ruiyou of the Chinese Consulate in Edinburgh were present at the grand welcoming ceremonies held respectively by the Royal Zoological Society of Scotland and FedEx, carrier of the two giant pandas. At around 13:00, under the genial sunshine of Edinburgh after the first snow in 2011, the chartered plane carrying Tian Tian and Yang Guang landed at Edinburgh Airport accompanied by the applause and cheers from the welcoming crowd. Nearly 50 reporters from China and the UK took up their photos to record this precious scene. Edinburgh Zoo was filled with joyful atmosphere. The entrance was spruced up,the large inflatable pandas were lovely, and the flags of China, UK and Scotland fluttered in the wind. Over 200 local and overseas Chinese children waited for Tian Tian and Yang Guang, full of excitement and expectation. Many citizens spontaneous lined the street. At around 14:00, the truck carrying Tian Tian and Yang Guang slowly came to the entrance of the Zoo, and the scene suddenly became astir. 10 pipers dressed in traditional Scottish costumes began to play a tune of welcome, and the children waved little flags of China, UK and Scotland and cheered with joy. Escorted by Chargé d'Affaires Qin and other distinguished guests from both sides, the bagpipers and the children, Tian Tian and Yang Guang entered their new home, thus beginning their 10 years of life in the UK. At the press conference held afterwards, Chargé d'Affaires Qin said that Tian Tian and Yang Guang convey the Chinese people's friendship towards the British People, and that their safe arrival in the UK marks the beginning of a new era in the scientific research and ecological conservation cooperation between China and the UK. Edinburgh is a blessed place. We hope that, under the concerted efforts of the scientists of both countries, Tian Tian and Yang Guang may give birth to cubs as soon as possible so as to bring along new results in joint research and provide more help to enable artificially reared giant pandas to go back to the nature. Chargé d'Affaires Qin said that the arrival of this pair of giant pandas surely will establish a new platform for the exchanges and cooperation between China and the UK in science, humanities and education, and give new vitality to the cultural and educational exchanges between the two countries. We believe that the lovely Tian Tian and Yang Guang will arouse the enthusiasms of more British young people for studying Chinese and help them understand more of China's nature, geography and culture. Chargé d'Affaires Qin also noted that, in the year of 2011 which is coming to an end, China-UK relations have kept a sound momentum for development. In 2012, we will witness one highlight after another in China-UK relations: the two countries will celebrate the 40th anniversary for the establishment diplomatic relations at ambassadorial level, China will be the Guest of Honor of the 2012 London Book Fair, and London will host the Olympic Games and the Paralympic Games. The arrival of the two giant pandas has unveiled the curtain for a series of intensive events. We hope that both sides may take this opportunity to convey our friendship and happiness, deepen our understanding and cooperation and push China-UK relations and the friendly exchanges between China and Scotland to a new and higher level. Deputy Directory-General Jia congratulated Tian Tian and Yang Guang's safe arrival in the UK on behalf of the State Forestry Administration of China. He said that today is a commemorable date. Giant panda is a national treasure of China and is also a precious world heritage. The scientific research and cooperation on giant pandas is a "flagship project" in international animal conservation. Today's grand reception has enabled us to vividly feel the British people's fond of giant pandas and their friendship towards the Chinese people. I believe that the cooperation between China Wildlife Conservation Associationand the Royal Zoological Society of Scotland will play a significant role in promoting future researches into giant panda conservation. Secretary of State Michael Moore warmly welcomed Tian Tian and Yang Guang's arrival on behalf of the UK Government. He said that he is glad that new achievements have constantly been made in UK-China relations. It is exciting to see that giant pandas come to the UK 17 years later. He felt much honored to be able to witness this historic moment with his own eyes. The giant panda project is not only an academic exchange, but also a government-to-government exchange and a people-to-people exchange. He hoped that Tian Tian and Yang Guang may further strengthen the two countries' cooperation in scientific research and ecological conservation, and facilitate the friendly and win-win cooperation between the country in various respects and at various levels. 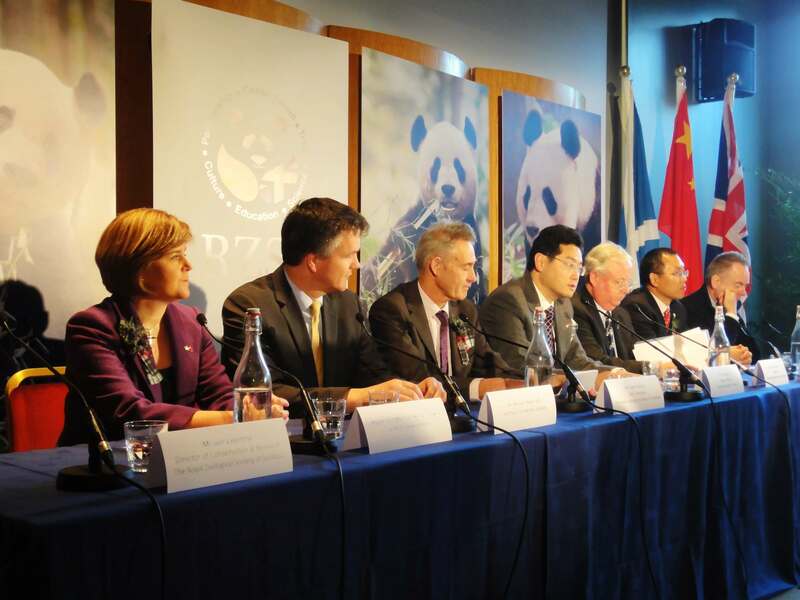 On behalf of the Scottish Government, Deputy First Minister Nocola Sturgeon warmly welcomed Tian Tian and Yang Guang's arrival in Scotland and expressed heartfelt gratitude towards the Chinese Government and the Chinese people. She said that today is a very special date. The giant pandas long-awaited by the Scottish people have finally settled down in Edinburgh Zoo. This will greatly enhance Edinburgh Zoo's status in international animal conservation, add to Edinburgh and Scotland's attractiveness and promote the exchanges and cooperation between Scotland and China in fields like scientific research, education and culture. Chairman Manus Fullerton said that today is a historic moment. Under the generous support from the parties concerned, Tian Tian and Yang Guang have come all the way to move into their new home in the UK. The two sides will launch a project of 10-year scientific research and conservation cooperation and educational events with the theme of giant pandas. Edinburgh Zoo will go to great lengths to create a comfortable living environment for Tian Tian and Yang Guang, and, together with experts from all sides, contribute to the conservation of the species of giant panda and strengthen the friendship between the peoples of the UK and China. 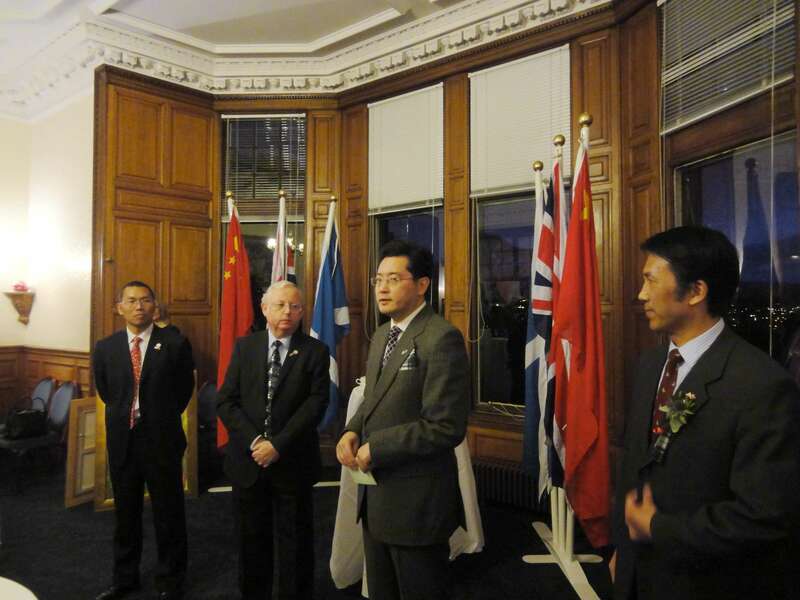 After the press conference, Chargé d'Affaires Qin, Deputy Director-General Jia and Consul-General Li respectively were interviewed by a number of British media outlets and then attended the reciprocal reception hosted by Chairman Manus Fullerton.